This school year we introduced ScootPad Solutions, a comprehensive set of student-centered learning solutions for teachers, parents and administrators. In this post, we’ll discuss how to use ScootPad in a 1:1 Learning Environment. Below we’ve broken down how ScootPad helps you implement this solution by simulating use on an iPad mini, a very popular device used by ScootPad teachers and students! ScootPad works with all popular web browsers on all operating systems, all popular devices (larger than 7″) and most popular platforms. As your district rolls out it’s BYOD policy or 1:1 initiative, rest assure that ScootPad enables Single Sign On (SSO) capabilities for seamless integration through any LMS system as shown below. 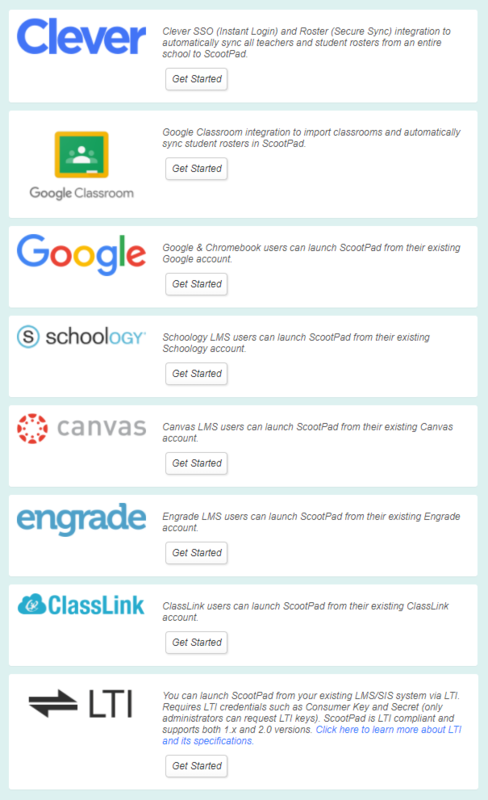 Teachers customize their classroom curriculum with ScootPad’s easy to use classroom wizard. Students are then able to launch ScootPad and receive automatic practice which continuously adapts for the student. Our proprietary algorithms ensure a tailored practice experience with each and every problem to meet the student’s need in the moment. When a student struggles with a concept, ScootPad automatically pushes a Time-Out lesson to help the student with that specific concept. As students launch adaptive practices, in addition to lessons, they will see multiple item types, different DOK-leveled questions and most importantly scaffolded content if applicable. ScootPad will detect when a student is struggling and will automatically scaffold content in real-time (across DOK and grade levels) providing the student with practice in pre-requisite concepts. This automatic intervention happens in real-time with no involvement from the teacher and seamlessly within the students’ adaptive practice. What a time saver for teachers! As students sign in to ScootPad on their personal devices, they have various ways of visualizing their own growth and progress. This keeps them motivated to reach for the stars! Learning Path % complete is a metric that is very prominent on their dashboard. Get started with this solution by checking out the resources below!